At the border of one of the largest highland areas of Central Italy and in the heart of the Simbruini Mountains Regional Park, lies the small Shrine of the Santissima Trinità (Very Holy Trinity). The site is located under a 300 m rock face. Due to that iconic appearance, it was a worship centre already in pre-Christian times. For over a millennium, the main object of veneration has been an atypical image of the Holy Trinity, painted in Byzantine style on the bare rock of one of the numerous grottos in the area. On the yearly day of the Trinity (40 days after Easter), thousands of people from villages in a radius of 50 km gather here. They stay for three nights and days in which they ceaselessly sing and pray. Many come walking or horseback-riding for several days, along the routes long used by transhumant herders. The pilgrimage and celebrations of the Santissima Trinità remain one of the most genuine manifestations of folk devotion in all of Italy and Western Europe. In the past fifteen years, the built area around the shrine has been enlarged to improve comfort and safety for the tens of thousands annual pilgrims. Next to the yearly pulse of traditional pilgrims, visitors are increasingly attracted year round by the shrine’s reputation for portentous graces, and its improving accessibility and infrastructures. If persistent, this trend could threaten some of the natural and aesthetic values of the site. Maintenance of the species-rich grasslands and precious silvo-pastoral mosaics surrounding the site is also undermined by the decline of animal husbandry and conservation measures. These had for many years privileged reforestation through traditional forms of management, for example limitations to hunting and understory management. Finally, ongoing normalization of the religious rituals may result in losses to the unique intangible cultural heritage associated with the site. In the near future, it would be desirable to: (1) raise greater awareness among both the major stakeholders and broader public about the site’s full spectrum of values; (2) have more support for the current efforts of park authority to embrace a biocultural approach to conservation; and (3) encourage the major stakeholders to negotiate a shared and sustainable vision for the future of the site. Although formally protected, conservation of natural and intangible heritages at this sacred natural site would benefit from a more conscious approach, for example inspired by IUCN-UNESCO Sacred Natural Sites Guidelines for Protected Area Managers. As a first step, specific research has been carried out since 2010, with the aim to understand the biocultural uniqueness of the site through ecological (floristic surveys, spatial analysis) and social science methods (participant observation, ethnographic interviews, focus groups). The research work completed so far has evidenced the interdependence of the ecological values of the area and traditional activities such as pilgrimage and animal herding. Some of the preferences and perspectives of local people about future developments have been collected. These efforts have thus highlighted the uniqueness of the intangible heritage associated with the shrine, supporting the claim for a biocultural approach to conservation. These insights are being expanded to inform discussions on site management and governance, and prepare processes of coalition-building in the near future. Karst rock formations and a thick beech forest characterize the site, which is also the source of the most important watercourse in the area, the river Simbrivio. In the surrounding plateaus, species-rich grasslands created by animal herding occasionally interrupt the forest. The most ancient trees, often pollarded or similarly managed, are found in these grassland patches. A rare population of Eriophorum Latifolium grows in the rocky habitats above the shrine. Wolves are newly repopulating the area. The shrine lies under the jurisdiction of the Bishopric of Anagni, which appoints an apposite priest (rettore) to supervise it. The rettore resides on-site during the opening period (May through October) and oversees maintenance and religious uses of the shrine. Brotherhoods of local people have a considerable role and independence in organizing the main celebrations, and a direct stake in site management. 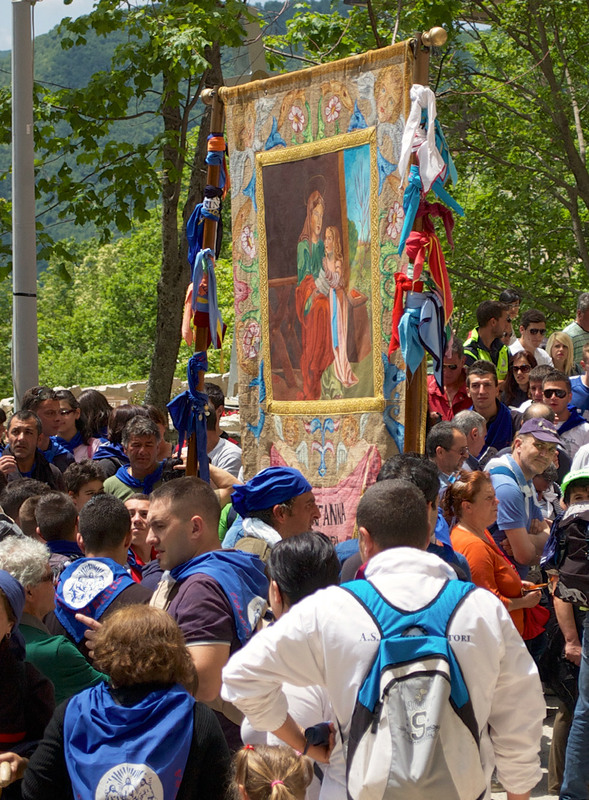 The brotherhoods more closely involved with the latter are those from Vallepietra, the nearest village, and Subiaco, a near town where the devotion to the Santissima Trinità translates into a complex rituality all year round. Although there are no formal restrictions, affiliation to the brotherhoods is usually inherited and, in the case of Subiaco, was limited to men until very recently. The plateaus around the shrine are locally-owned silvo-pastoral collective properties. Given the decline of traditional economic activities and decreasing pressure on the resources, they have been accessible also to outsiders in exchange of an annual fee for some decades. Presently, governance of the site remains relatively fragmented. Despite attempts at cooperative action, there still seems to be no consensual vision shared by all main stakeholders, that is, local people, administrators, the Church, and the park management. Promoting rural development was defined as a major objective of the park at the moment of creation. However, local people claim that little attention has been paid to traditional local heritage, and skepticism has grown in the years due to administrative scandals. Overall, the main stakeholders seem to focus mainly on a specific value important to them, but there does not seem to be an integrated vision on the interlinked spiritual, cultural and ecological values of the site. The park was created with a Regional Law of Lazio in 1983 and partly overlaps with the European Natura 2000 network. It covers an area of about 300km2, not including the highland areas belonging to neighbouring regions (Abruzzi). Minimal intervention management ‘for nature’ as implemented and encouraged by Natura 2000, is not adequate to optimize conservation of cultural landscapes in the area. This management indiscriminately applies an idea of ‘naturalness’ to all habitats, and does not acknowledge the importance of traditional productive practices (such as pastoralism, sustainable agriculture, and understory management) in creating biological values. Local groups, such as animal herders, have little voice in decision-making mechanisms, despite representing key traditional activities. Other players, such as the Church, have specific interests driven by regional or national priorities. Therefore, management regimes inspired by IUCN Category V of protected areas appear to be more appropriate. - Traditional song in praise of the Santissima Trinità. Frascaroli, F., Bhagwat, S., Guarino, R., Chiarucci, A., Schmid, B. (in press) Shrines in Central Italy conserve plant diversity and large trees. AMBIO. Frascaroli, F., Verschuuren, B. (2016) Linking biocultural diversity and sacred sites: evidence and recommendations in the European framework. In: Agnoletti, M., Emanueli, F. (eds.) Biocultural diversity in Europe, Cham: Springer Verlag, p. 389-417. Frascaroli, F., Bhagwat, S., Diemer, M. (2014) Healing animals, feeding souls: ethnobotanical values at sacred sites in Central Italy. Economic Botany 68: 438-451. Frascaroli, F. (2013) Catholicism and conservation: the potential of sacred natural sites for biodiversity management in Central Italy. Human Ecology 41: 587–601. Fedeli Bernardini, F. (2000) Nessuno vada nella terra senza luna: Etnografia del pellegrinaggio al Santuario della Santissima Trinità di Vallepietra. Tivoli: Provincia di Roma.